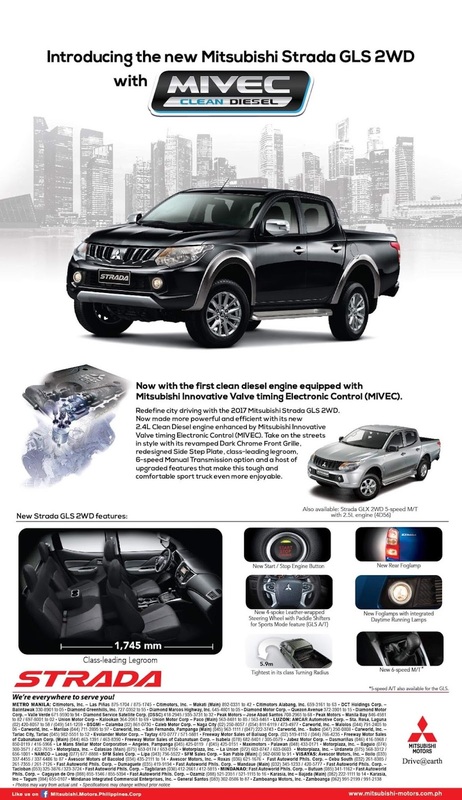 Already in our Monthly Car Price Guide earlier this month (in automatic guise at least), Mitsubishi Motors Philippines Corporation (MMPC) is spearheading the shift to clean diesel technology with the launch of a new Strada pickup truck variant that comes equipped with the 4N15 MIVEC engine. Once exclusive to the top-of-the-line Strada GT and automatic equipped 2WD A/T variant, this engine is finally paired to a 2WD drivetrain and a manual gearbox. Like the Montero Sport and Strada GT, the 4N15 MIVEC engine in the GLS 2WD also outputs 181 horsepower and 430 Nm of torque. While the automatic still comes with 5 forward gears with INVECS-II sports mode, the manual comes with a 6 forward gears. It lets the drive take total control with its wide shift ratio and easy-to-modulate clutch. Like the Strada GT, the GLS 2WD variant is now give a new dark chrome grille and side step plate. The variant is also equipped with side mirrors with integrated LED turn signals and power folding function. The front fog lamps also integrate daytime running lights while new rear fog lights contribute to better on-road visibility. Capping off the sporty exterior is a set of 17-inch alloy wheels. The spacious Strada has a new front seat design with a body-hugging fit and deeper center trim. The black high-grade fabric seats also up the cabin’s feel while a 4-spoke leather-wrapped steering wheel with audio and cruise control functions complete the changes. 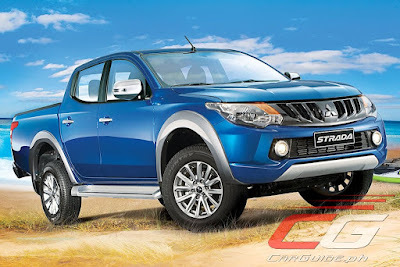 The Strada GLS 2WD also boasts of first-class safety features that include dual SRS airbags, anti-lock brakes with brakeforce distribution, and Mitsubishi’s proprietary RISE (Reinforced Impact Safety Evolution) body construction. The Strada GLS 2WD is now available at all Mitsubishi dealerships nationwide with a price of P 1,215,000 for the M/T and P 1,295,000 for the A/T. It comes with a 3-year, 100,000-kilometer warranty. Is there really such thing as clean diesel? If so, why is France phasing out all diesel cars in a near future? We'll, we're Euro 4 so the MIVEC diesel is clean by our standards. Well, they did black it out. Boss uly pwedeng patulong kung Ani sa tingin mo Ang best choice between nitong Strada GLS 4x2 MT or Navara el calibre 4x2 MT? Hmmmmmm... I haven't driven either one so I can't say. Although the Navara does have a plusher ride though the Strada is said to be cheaper to maintain. how about ranger XLT 4x2, Hilux 4x2 G at Dmax 4x2 po boss uly?